how we do it in Coperno? While designing a site we follow two important steps. The first is user experience design. Here we study the behaviour pattern of users from different demography and plan a wireframe (blueprint) by combining the inputs from different studies. After this, the next step is designing the user interface based on that wireframe. So, the UI designers build every element that a user would interact or engage with on an actual live task. Making it simple yet attractive is not easy, but our designers are top notch and great at what they do. In Coperno we create uniquely branded user interfaces that truly represent your software without compromising with its usability. We maintain a proper UI/UX balance in order to create a system which is both adaptable and usable. 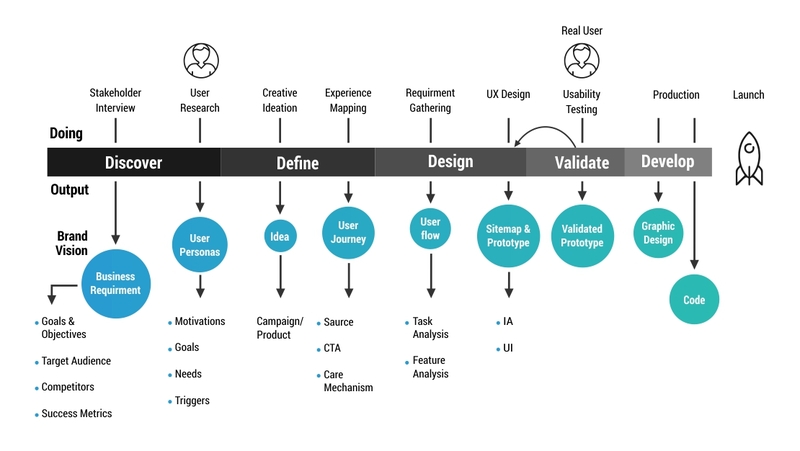 Our user-centered design process solves complex problems through user research, expert analysis, prototyping, a collaborative design with stakeholders and users. In nutshell, we are defining unforgettable customer experiences. Understand the product goals: We start by creating a shared knowledge bank of research based on an understanding of your company’s vision and business problems. Customer journey mapping: We create an outline and identify core functionality of your product that requires additional attention to detail. We have everyone simultaneously iterating on user feedback. UX flow through Wireframing: We follow this process to include all features and structural assumptions as rough sketches with the use of tools like Axure or pencil & paper. Detailing every information onto sketches and building a correct flow is critical before actual designing and this phase ensures the product has been broadly figured out. Creating / Understanding your brand language: You are presented with design strategies that convey your brand identity and message to your target audience by showing you style tiles, collections of typography and color schemes. User interface & visual design: Roll off the design piece to product-centric engineers who are versed in handling transitions while keeping in mind the long-term vision of the product. Usability Testing & Analytics: Our task-based mobile app usability testing solution goes for real users to evaluate your app and these valuable insights further help you to measure, manage and enhance your app’s performance during the initial stages of deployment. With perfect User interface design (UI) and User experience design (UX) we defining an awesome customer experience (CX) which have the great impact on overall Brand experience (BX).